Sub's have radar masts, and supposedly gold plated sensors to detect a whale breaking wind a hundred miles away so it's worrying all the Iranians need is a ferry full of kebab vans. 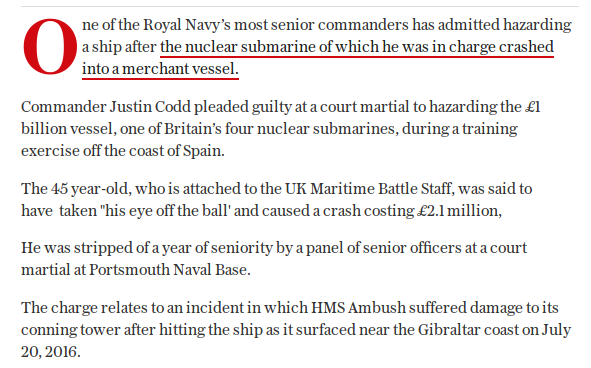 Maybe they on the sub were preoccupied with their stealth ethos like a certain Norwegian destroyer recently ? Probably about a year. They do strange stuff like checking facts. Investigations could be rattled off far quicker if they were to outsource them to us. Thank you for that link. Have just had a brief look, and see one incident involving an RN vessel and 9 involving ro ro ferry/cargo ships out of a total of 22 investigations. Maybe somthing to think about when voicing opinions on RN navigation and lookout. The only RN Navigator I have met and sailed with was absolutely top notch; he ended up in command of a Type 45, and my yotmaster instructor was at least equally brilliant, he was an ex-RN sub driver. However there are abberations, like the Type 42 with an inexperienced OOW left to cope getting T-Boned by a tanker years ago, let alone the recent collisions with what should be the worlds' best warships, two Arleigh Burkes in the space of a few months and the shocking report on the Fitzgerald. And the Astute class sub HMS Ambush coming into Gibraltar with quite serious collision damage. I've always disagreed with Montserrat, the Sea isn't Cruel, but if you let your guard down it'll have you for breakfast. Having encountered those ferries dozens of times on that route of not seen even a hint of them taking that attitude. Indeed. I've met the Stena and P&O ones - it's difficult not to, as there are two on each route, sailing more-or-less constantly - everywhere between Cairnryan port and Belfast Lough and have always found them to be assiduous and courteous in sharing the sea. I know. I've sailed in the Aland Islands and watched them squeeze through some pretty narrow channels between the rocks. Must've been well over a hundred different transits on their route. I rarely see them doing more than about 20Kts ish in the North Channel. Guzzling jet thingys guzzled their fuel budget too quickly if they put their foot down. Think they sold them to Venezeula as they could afford the fuel, or at least they thought they could. The big issue for the North Channel route, apart from speed limits in Loch Ryan and Belfast Port, was that they are very picky about sea conditions and can't cope with big waves. As a result they could only operate something like 60% of planned sailings which was killing business. The basic idea of "We can get you to Belfast quicker than you can via Larne and the motorway" was good but only if they sailed. Great fun to travel on. Remind us how many ships the RN has these days. CalMac alone has 31 ro-ro ferries in service, doing around 10 sailings per day, year round, on average. Indeed. Particularly when you remember that RN accidents are not investigated by the MAIB unless they involve civilian craft. Last edited by JumbleDuck; 24-01-19 at 20:48. Yes, the shallow water shouldn't have been there.